These are the three Web sites on which I spend the most time, as most of you know! I’m amazed at all the things we can do online. If you look closely in the montage above, you’ll see some of my other favorite things: Above the Facebook logo, you’ll see a Google toolbar. I love it! It allows me to have my bookmarks on any computer (They’re listed under that star icon on the toolbar …), see when there is something unread in my Google Reader (the first icon in the toolbar …) and have my Google calendar (the second icon …) just a click away. 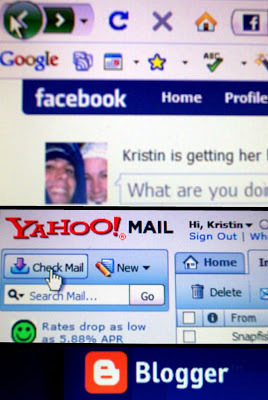 Then you’ll see the first e-mail in the small portion of my Yahoo! inbox is from Snapfish. I love Snapfish + Shutterfly. The prices are great for photo prints + there are lots of great gift ideas. Oh, and I made that photo collage with my photo editing software, Microsoft Picture It! Premium 10, which also has a photo organizing library. I didn’t even mention my cell phone! Yes, I’m indeed thankful for technology, mostly for the way it allows me to keep in touch with people + perserve memories. I love technology too!! I mean, without it, we’d be e-mail-less and not able to blog and keep up with each other!